Washington, D.C. — As a growing group of environmental leaders call on Walmart to stop greenwashing and commit to real sustainability, a new study finds that Walmart is one of the nation’s largest users of coal-fired electricity, and that its heavy reliance on dirty power pumps nearly 8 million metric tons of carbon pollution into the air each year. 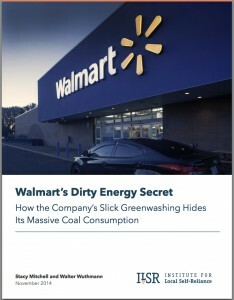 In its latest report, Walmart’s Dirty Energy Secret: How the Company’s Slick Greenwashing Hides Its Massive Coal Consumption, the Institute for Local Self-Reliance (ILSR) calculates the total electricity use, coal-fired power consumption and resulting greenhouse gas emissions of every Walmart store and distribution center in the country. 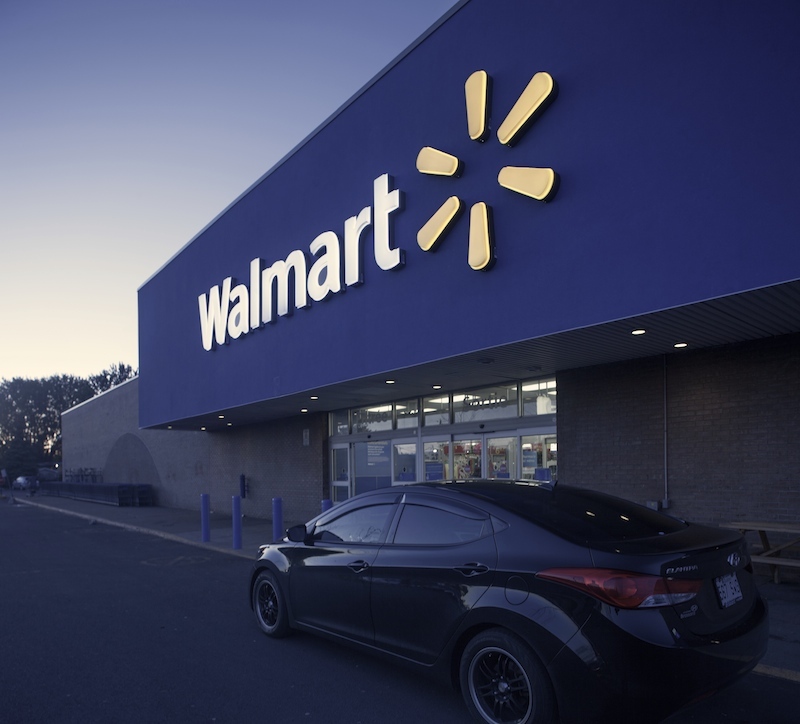 According to the report, Walmart’s U.S. operations use nearly six times the amount of electricity as the entire U.S. auto industry. The operations use more than 4.2 million tons of coal each year, accounting for nearly 75 percent of the company’s total emissions from U.S. electricity use. Many other retailers, including Kohl’s and Ikea, are dramatically outpacing Walmart in the shift to renewable energy. Ikea has installed rooftop solar panels on 90 percent of its U.S. stores, including in many heavy coal-using states where Walmart has no renewable energy projects. Walmart’s few clean energy projects do little to offset its heavy reliance on coal-fired electricity, providing just 3 percent of its total U.S. electricity. At the same time, the company spends millions of dollars in political donations to candidates who favor dirty energy and oppose action on climate change. In the 2011-2012 election cycle, more than half of the Congressional candidates supported by Walmart and the Walton family received a 100% Dirty Energy Money score from Oil Change International. 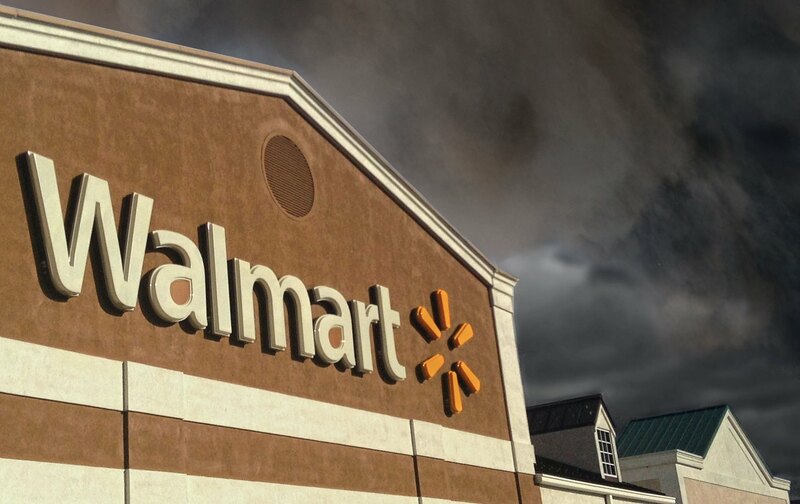 “Rather than fulfill the climate commitments it’s been making for years, Walmart is continuing to hurt the health and prosperity of our communities and families while endangering our planet,” said Michael Brune, executive director of Sierra Club. Walmart’s reliance on coal-fired electricity is adding to carbon pollution in a number of states, including Missouri, Illinois, Ohio and Texas. In the 10 states where Walmart uses the most coal-fired electricity, the company is responsible for consuming more than 2 million short tons of coal each year, equivalent to nearly 4 million metric tons of greenhouse gas emissions. In Missouri and Illinois, where there are many highly-polluting coal plants, Walmart uses about 900 million kilowatt hours of coal-fired electricity annually, resulting in over 900,000 metric tons of carbon pollution. Over the past year, environmental organizations, including Greenpeace, Rainforest Action Network and Energy Action Coalition, have called on Walmart to take real steps to reduce carbon pollution. In April, Environmental Action and the Green Life, a consumer protection group, named Walmart the worst greenwasher of the year. By supporting clean energy, reducing its carbon pollution and ending support for politicians who oppose climate action, Walmart could help create hundreds of thousands of new jobs and accelerate the transition to a cleaner, more sustainable energy mix. Last year, ILSR found that since Walmart launched its environmental campaign in 2005, the company’s self-reported greenhouse gas emissions have grown by 14 percent. An ILSR study released last month found that the Walton family—the majority owners of Walmart—are impeding America’s transition to a clean energy future and funding nearly two dozen anti-solar groups that are waging state and national fights to roll back clean energy policies.